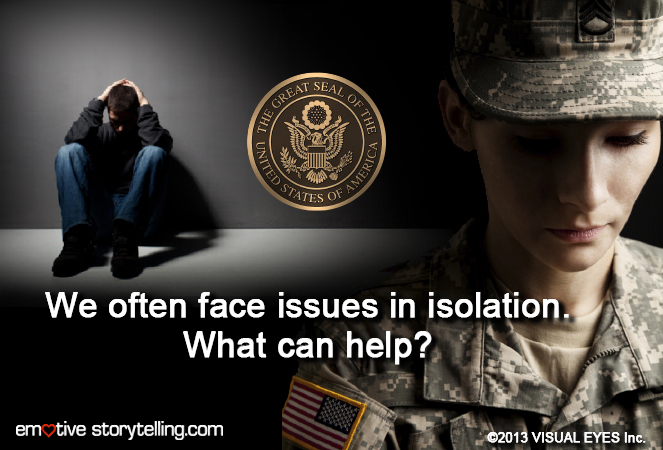 We face issues in isolation. Despite the fact that our healthcare system, mental health treatment models and behavioral health interventions are often face-to-face centered or group support-focused, most people face their issues alone. Problems are most challenging when people are in their own space, place and moment. That means without their spouse, friends or healthcare provider nearby. The feeling of being separated or disliked is fertile ground for the brain’s negativity bias to act up – big time. Researcher John Cacioppo, Ph.D. and his team found that our brains have a heightened sensitivity to negative information. When the brain perceives negative stimuli, a surge of electrical activity occurs almost immediately; whereas, the brain takes much longer to process positive stimuli. This fast-acting negativity mobilizes physiological responses to think, feel, and act. It makes a lot of sense for survival, but it’s a problem for recovering veterans, patients and even partners in troubled relationships. To make matters worse, the negativity bias can be exacerbated by isolation so that depression, fear and anger become larger issues. To offset isolation and a downward spiral, most psychologists recommend social support, social skills and social interaction. In the mix of all this social stuff, there’s a storytelling factor. When people get together and share experiences, something special happens. Stories can generate empathy, and researchers have found that empathy – even toward strangers – triggers oxytocin, the chemical associated with bonding and stress reduction. To offset the over-weighed negativity bias, researchers have found that it takes about five times as many positive influences to outweigh one negative experience. Not to worry though, even small positive experiences can make a difference. So what’s the main point? Share life experiences. Do it often. Do it in person. Do it on video to make it easy and long-lasting. Videos that encourage can teach and re-teach students, patients and partners to thwart the negativity bias for good.